A successful few years at university can set you up for life. Whether you know it or not, studying at uni gives you great interpersonal skills that you can take into any workplace. 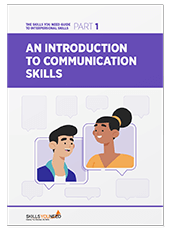 These skills enable you to work well with others and succeed independently: you’ll learn to work alongside different personality types, and you’ll build the confidence to present work in front of your peers. This article gives you the top 10 interpersonal skills that you learn at uni. What do you think you’re good at? Where can you improve? Refer to our tips as a guide! How you respond to feedback is significant in your development as a professional, and it all starts at uni. Receiving feedback on a piece of work is only half the battle: a good student will absorb the feedback and take note of where they can improve, and then they’ll apply what they’ve learned to their next assignment. This proves incredibly relevant in the working world. If you want that promotion, you need to think about how your manager’s feedback can improve what you do. A lot of students start university a bit shy or apprehensive to step forward. By the time graduation rolls around, they’ll have been put in positions where they’ve had to present work among peers and generally get out of their comfort zones. It’s invaluable. The same applies in the workplace – you’ll have often heard that “a bit of confidence goes a long way”, and it’s true. At uni, deadlines loom left, right, and centre. The pressure intensifies as you enter your final year as a student, with a huge assignment that’s the summation of three (or four) years of studying. Even years later, the word ‘dissertation’ makes our hair stand on end! There are reasons why university can be so stressful. Deadlines give you the responsibility of managing your own time, and they mean that you have to work hard. Both, of course, are vital for professional success. All those hours spent poring over books in the library will come in handy after graduation. Hard work pays off! Closely linked to self-confidence, body language is a clear indication of someone’s confidence and self-awareness. In a job interview, for example, body language is so important. Try not to slouch; make sure you smile; offer a firm handshake; speak clearly. These are things you’ll have been told from an early age, probably way before university. Positive and open body language helps us make friends, it encourages our workmates to initiate conversation, and it could help us get the jobs that we want. Again, it’s something that grows with time at university. Many students have to interview for places on their courses, which is brilliant experience. Not everyone is a fan of group work, but it’s an undeniable requirement for every university syllabus (and most jobs). Whether you study fine art or economics, you will have to work alongside others on shared projects. When you go out into the world of work, you may have different responsibilities to your colleagues, but you’ll work towards a common goal. So, being able to collaborate is vital. It’s conducive to problem-solving, it encourages creativity, and it strengthens interpersonal relationships. Being a good listener will definitely set you up for success. At university, good listeners will be receptive to other people’s opinions and will develop their communication skills as long as they listen closely and absorb information. In the workplace, this can be as simple as listening closely to instructions, or as nuanced as understanding someone’s approach and combining it with your own. Listening skills are invaluable, and you can transfer them from university to the working world. It’s relevant both professionally and socially. Here’s something else that you’ll (hopefully) have learned from an early age: manners are an essential interpersonal skill. At university, you’ll be far more approachable and likely to make friends more easily if you’re polite. In the workplace, you’ll represent your company in the best way possible and you’ll set a good example. As a side-note, many are guilty of assuming low intelligence in someone with poor manners. As we mentioned earlier, university can be a stressful time. It’s here where we practise self-care to ensure that we keep on top of deadlines and that we don’t let the pressure affect us in the wrong way. We manage our time, we prioritise assignments, and we take regular breaks when we need to. These are skills that are extremely relevant professionally. We need to know what helps us keep our heads above water. If we’re stressed at work, there needs to be somebody on our team that can help. This requires communication skills, whether you’re a student or a professional. Can you tell your tutor that the workload is too much? Are you able to ask your manager to redistribute some of your work? At uni, you learn to think on your feet. Which books are you going to base your research on? Will you go down one avenue, or the other? What targets are you going to set yourself for your next assignment? These are questions that all good students ask themselves, and the decisions they make are influential later on in their professional careers. This is one of the most important skills that we develop at university, although it’s often overlooked. Its sibling, IQ (intelligence quotient), is more quantifiable and is backed by data. But a high IQ will only take you so far. As much as they’d like to, students cannot hire PAs to manage their time, money, and workloads. It’s the student’s responsibility, and this includes emotional management as well as mental health. Self-motivation is a skill that builds with time. It helps to know why you’re studying a certain topic, or why you’re working in a particular industry. It’s much easier to motivate yourself when you have purpose. How well can you step into somebody else’s shoes and see things from their perspective? This is empathy, and students need it in heaps at uni. Supporting a stressed friend or colleague? Empathy is key. Education requires us to build relationships, and it’s much the same at university. Our capacity to create and build relationships is integral to life after university. We’re social creatures, after all. We build self-awareness at university and we maintain it in both our social and professional lives. It’s to do with how well we understand ourselves, how we present ourselves, and how we express ourselves. It’s invaluable. Callum Dawson is a writer for Mears Student Life, a provider of affordable, high-quality student housing with three top UK locations.